While intermodal typically isn't good for short-haul moves, it's gaining serious steam for long-haul freight. Slow service. Indirect routes. Poor visibility. Required increases in inventory levels. These are just some of the reasons consumer goods companies have given for avoiding use of intermodal rail for freight moves. But rail service has improved to the point that products that would never have seen the inside of an intermodal container are now moving across the country at a lower cost and with a reduced carbon footprint. 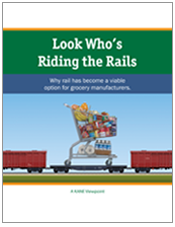 This paper examines the changes that have made rail a viable option for consumer products, and provides examples of companies that have made the shift from truck to rail, with impressive results.